I just spoke with my wife. I'm in for the weekend build. I'll be there if someone can give me direction from indianapolis. I also talked to my roommate, he wants to ride up with me to tint the car. He's been tinting for 10 years and does INCREDIBLE WORK. Consider the window tint taken care of. I'll leave friday the 20th so i'll need to work out some hotel arrangements if anyone can help. I'll also bring the ground fx with me. I have a spray booth in my garage so i can paint the ground fx before hand if need be, or should I just prep them and leave the paint to the body shop? I just got back from Indy 2 weeks ago!!!!! National FFA Convention! Yeah I was one of those b**t**dS that made you late for work and made extra lines everywhere in the 50 mile radius! haha it is easy, but I will advise you to stay out of Chicago. It is easy to bypass and well worth it. Go up to Pioria, IL to Rockford and then there is a major freeway cut accross over to WI Then just stay on the Interstate and hit Minneapolis. its a solid 16hrs, but not to bad! Sweet!!! chris cook just called me back and he's happy to donate the sail panels!! Would we like anything printed in them? GT? SE? He's going to custom make them just for tyler. Let me kow asap because he's cuttin the lexan as we speak! I believe GT will be fine in white, with the red line in the middle of the lettering.. Like the G is two lines, one inside the other with a gap between, if you put red in there, that would look great. I leave it up to Tyler and Nick, and AWESOME that Chris is willing to help. Oh! And if they can be tinted, that would be great. It would go along with the windows. Minnesota tint laws do not allow anything darker than 50% plus or minus 3%.. The Quarter windows do not count.. But the normal windows do. He could probably safely get away with 30 or 35% up there.. He will be a local celebrity. In more ways than one. I have been spreading this thread around, because I am trying to get coverage for Tyler's story. There are doctors out there who have undoubtedly dealt with people who are or have gone through the same thing. My goal is to get this to someone who can step up to the plate and say "I have worked with this before, let's see what we can do." Jay Tyler's dad said something like "wow all of these guys are comin' up to help and donating all these parts? That is wild" Tyler responds "That's what happens when you have a sweet car"
One thing I left out in my previous post is this morning I asked Tyler about the intake and valve covers. He said the stock colors would be nice and what would be Really cool is white/black or white/silver to match the car. I like that idea. That was one of his ideas he had this morning. As fast as the tint. I have 15% on my car and I only got one ticket. haha Tyler was with on that one. We were cruisin to much..... I think we can push the envelope a little and maybe like 30%. We talked about the passenger side window and he seems to think it could be a loose wire or bad switch. It works intermittedly. Broken wire in the rubber conduit between the door and the chassis. I had that happen on my car as well. Can be fixed, but not easy. fieroguy123 is on the ball. We now have sail panels being made as we speak by the guy who made the ones listed above. He will also be coming up to Frazee for the weekend, along with his wife and friend by the sounds of it. We have an event! Infinite Will, please send the door molding piece to the address that Nick listed above. We'll get that up there and get it ready to roll when we get up there. My local audio shop is reviewing this thread with intent to donate the required stereo equipment we need to finish his audio system. I'll keep you all posted on that one. And as far as the tint goes, rod carries 50, 35, 20, and 5. I think 35% is going to be the safe bet. He uses the best film on the market, there will be nothing to worry about when he's finished. He is the only guy in the U.S. who has tinted a bughatti Veyron. He's very good. Also I just wanted to say this... All of you out there who have stepped up and reached out to tyler and contributed to his dream will be rewarded in the end. 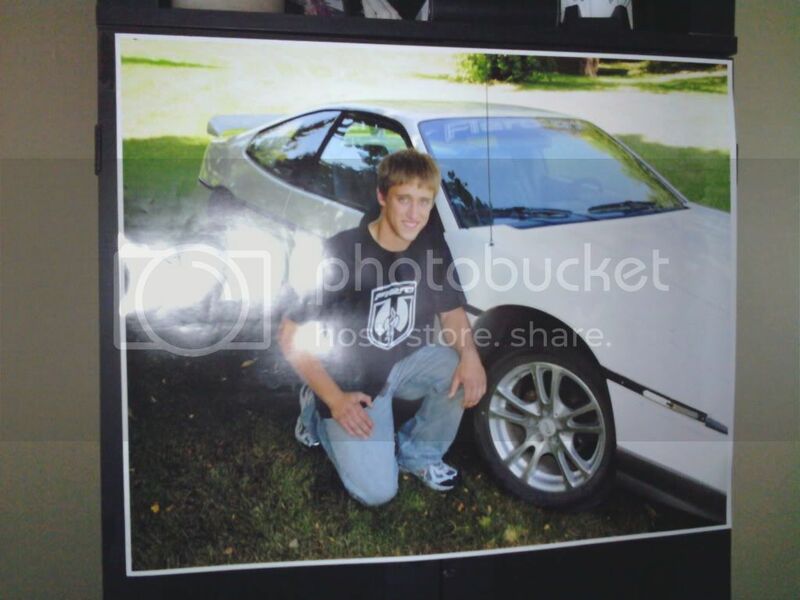 The Fiero community has the biggest heart of any car organization I have ever seen and it is nothing short of amazing. We are the true definition of a family and it will be recognized by others as a good deed and an excellent example of what every organization should be. Thanks to you all. www.fieros.eu and Fiero1Fan has agreed to donate a LED Third brake lamp module. Sweet. And thanks for looking. Yeah, factory trim silver. I have a good door trim (silver) off an 86 GT with the metal mount bracket if needed. Just say the word and I'll ship it before Friday. Hulki/Andy, I am completely amazed by your compasion and commitment. Thousands of miles away, already sacrificing more than anyone could ask for your country and you take the time to get this thing rolling. Please stay safe and come home soon. Synthesis, It takes a special person to step up and take the reigns as you have. Big props to you for all your hard work and organization. To everyone involved. You are all an awesome group of people and I am proud to be associated with folks like you that have the heart and will to drop whatever is in your personal lives to help make a complete strangers life a little better. My faith and hope in people has been raised to a new level. Thanks to all of you. I can't wait to see Tyler sitting in that "custom" GT with a grin from ear to ear. Lynxer. 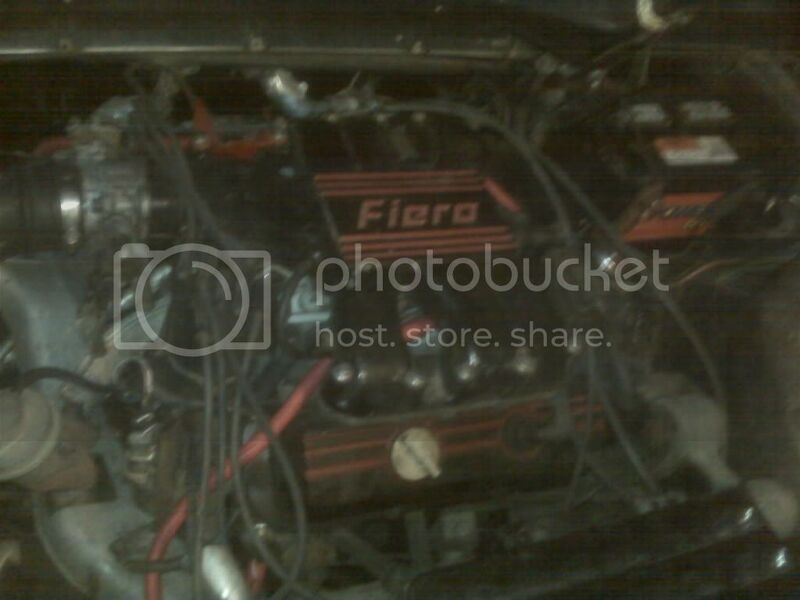 This is a pic of my fiero engine. I could do it how mine is. Only the red spots will be white. Or the black will be white and the red will be black. This probably goes without saying, but anyone going that is a photographer ( No camera phone's please! ) , please get LOTS of photo's of the car before, during and after. This way the ones of us that can't make it can follow the progress. Damn Chris (Synthesis) that's awesome! The remote start will just take it OVER THE TOP! Great work on contacting them and getting it donated!!!! John. That was mean lol. Its just me and my blackberry for internet. Hey that's 2 megapixle of quality . As soon as I get a answer from lynxer I will pull the pic down. Antuzzi hahah! That's not what I meant, don't pull that picture down! I meant for the before during and afters of Tylers car. THOSE are the one's we need in high quality. This is a good link to use for those needing verification from potential donor's of the legitimacy of the situation. I was thinking about it. What does every 18 year old want in his car? Nitrous(sp)! Something about a big blue bottle hits the spot. And john. I'm no longer talking to you. I am a sap... I am all teary eyed because of this one line in the article here. ..........And john. I'm no longer talking to you. Does this mean I have to find a headliner somewhere else now? My mom is a professional photographer, but she might get annoying taking to many pics. You my friend are not a photographer then hehehe There is no such thing as "too many pics". A true photographers motto, "take as many pictures as you can, and weed them out later". When I photographed fireworks over Niagara Falls, I took over 100 photo's in that 20 minutes of fireworks. When I got home, 5 were really good, and only one of them was good enough to blow up, have matted, framed, and is now hanging in my living room. John. I told you like 3 pages ago call me. He can't. He's busy touting his photography skills. My phone has a 5 megapixel kodak camera on it. All of the pics on my cardomain site (including the sail panels above) were taken with it. It's of very high quality. I'll be there for the build weekend. Just got my information im going to be flying out on the 19 (thrusday) and comming back on the 23rd (monday) so were gona get this done. Damn right were gonna get this done! 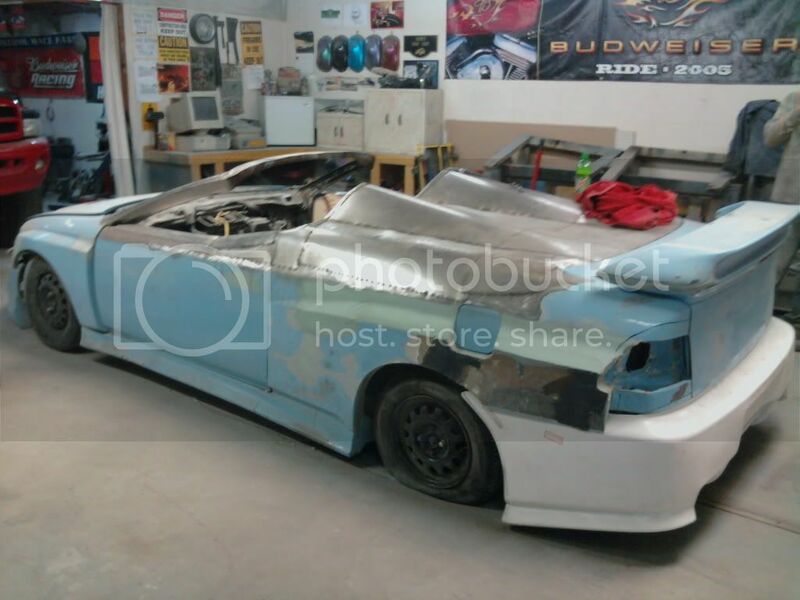 A fellow fiero guy needs our help!!! So I'm comin out with a truck load of parts and tools. Im gona take my tools as well. 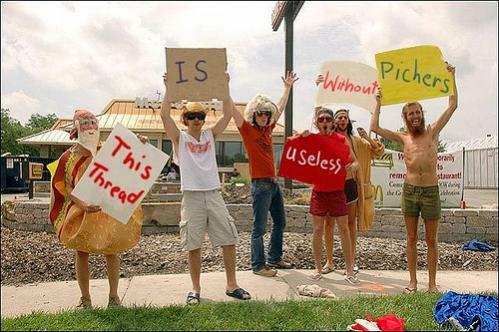 I dont know if they will let trhem on the p[lane though. Another question. Im gona need picking up at the Minneapolis airport and possabley a place to crash. any one feel like helpin me out? I may be able to help. I'll be passing through there on friday evening (the 20th) on my way to podunk. Do you have a flight scheduled? I have to look at the email i think ill be getting there around noon on thursday. We will have most of the tools needed there. The special tools for like windows and windshields I`m thinking you should bring. 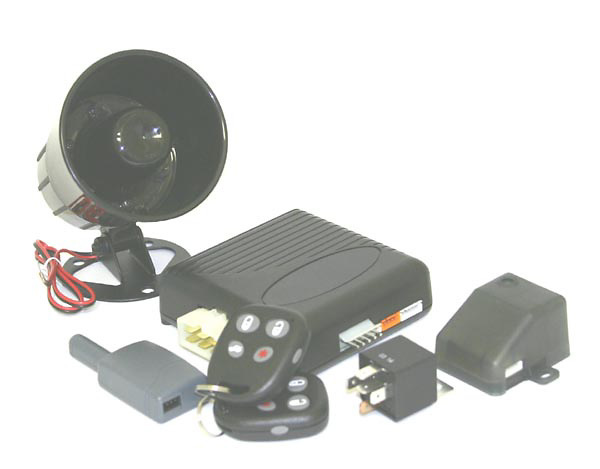 Anything that is a special tool, we may not have, but alot of the basic tools will be there. Ike has an awesome shop, and is a Great Host. I did secure a shop! They are very busy and a little crampt for space, but we are going to make it work. The good thing is it is right in town and parts store's and the fleet store is very accessable. Also I am going to bring my tools in to the shop and then we don't mess them up to bad He has alot of specialty tools and we are welcome to use them if we need to, but I just think we will be better guests by using mine. One thing is we will need to all sign a waiver when we come into the shop just in case of someone getting hurt which is the owner just being safe and smart. Here is a shot of the work area we will have for the weekend. It is Warm, Dry and more than suitable.